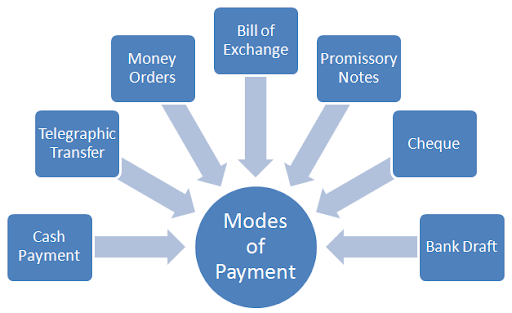 Different Modes of Payment - What are Types of Payment? Post: Gaurav Akrani. Date: 4/05/2011. No Comments. Label: Economics. The payment can be made in many different ways like by giving Cash, doing Telegraphic Transfer or Mail Transfer, via Money Order or Postal Order, Bill of Exchange, Promissory Note, Cheque, Bank Draft, etc. This is one of the oldest modes of payment. In this case, the buyer pays money in the form of notes and coins to the seller. The seller on receipt of cash, issues cash memo or cash receipt. This mode of payment is suitable only for small transactions. In this system, the payer deposits the money along with other charges in a bank which has a branch office at the payee's place. On receipt of cash and other charges, the bank telegraphically informs the branch office to credit the amount to the payee's A/C. The payee is accordingly informed and can withdraw the money. The money can also be remitted by mail transfers, which takes a little longer time. This method helps for quick remittance, but it is not a popular one. Payment can also be remitted through money orders and postal orders. Businessmen may prefer more of postal orders because a large number of postal orders can be collected and encashed at a time. Postal order is safer than a money order. Postal orders can be crossed for safety purpose. However, traders normally do not use this method of payment. According to the Section 5 of Indian Negotiable Instruments Act, 1881, "A bill of exchange is an instrument in writing containing an unconditional order, signed by the maker, directing a certain person to pay a certain sum of money only to, or to the order of, a certain person to the bearer of the instrument." discounting the bill with his bank. The bill can be transferred to another person. It enables the buyer to purchase the goods without making actual payment. He accept the bill & make payment at a later date. A promissory note is an instrument in writing (not being a bank note or e currency note) containing an unconditional undertaking signed by the maker, to pay a certain sum of money only to, or to the order of a certain person, or to the bearer of the instrument. Every businessman has a bank account to facilitate his business transactions. When the bank account is opened, the bank gives a cheque book for making payments. cheque payment is a convenient and safer mode of payment. To ensure safety the cheque may be crossed generally or specially, so that the payment to a wrong person is prevented. A Bank Draft is defined as "An order to pay money, drawn by one office of a bank upon another office of the same bank for a sum of money payable to order on demand." Bank drafts are often used for the purpose of transferring funds from one place to another within a country or from one country to another. A bank draft is an order given by one bank upon another of its branch bank situated elsewhere to pay a certain sum of money. The contents of bank draft is more or less that of a cheque, but it is signed not by the payer but by the banker.